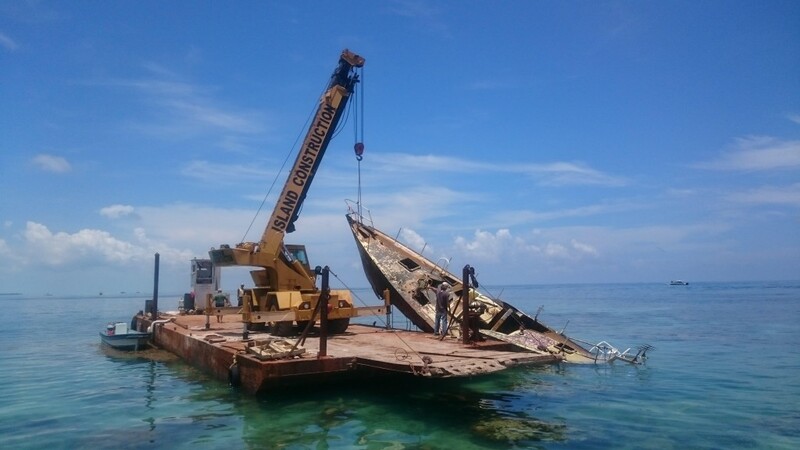 On Thursday, August 28th the sailboat “Termaji” was finally removed from the Belize Barrier Reef. Originally from France, the Termaji had ran aground on a portion of reef just south of the Northern Cut (Caye Caulker Channel) on December 30, 2014, and it was not until several complaints from residents and Oceana Belize that the Department of Environment (DOE) released information on the grounding. But the removal operation did not take place until eight months after the accident and there has been no indication as to who the vessel belongs too. The 40-foot, blue and red steel hull sail boat was removed by Island Construction Company Limited, who was contracted by the DOE. The operation took about two and a half hours, as the operation was not only to remove the vessel but also salvage as much as possible. Upon removal, the vessel was hauled away to a secure location until DOE can complete its prosecution case against the owner, who will be required to pay compensation for the damages to the reef. Initial reports indicated that after the grounding, a 100 gallon tank of diesel, which was stored inside the sailboat, was removed to prevent any spill or contamination of the exposed reef crest. The Termaji was then moved approximately 15-20ft away from its original position into deeper water, where it was secured to ensure as minimal damage as possible to coral colonies nearby. DOE also reported that the owner of the vessel, a French National, left the country shortly after the grounding, but remained in contact until around March 2015, when he stopped accepting calls from Belizean authorities. In order to remove the vessel from the sea, the Government of Belize (GOB) has had to incur all expenses. In addition, the extensive Environmental Damage Assessment made on the grounding area indicates coral reef damage. GOB is now working to bring criminal charges in absentia against the owner of the boat, whereupon he will be required not only to pay for the damages made to the environment, but also all costs incurred during removal efforts. On another note, GOB is looking to reform legislation in order to properly hold persons responsible for groundings accountable for their actions.